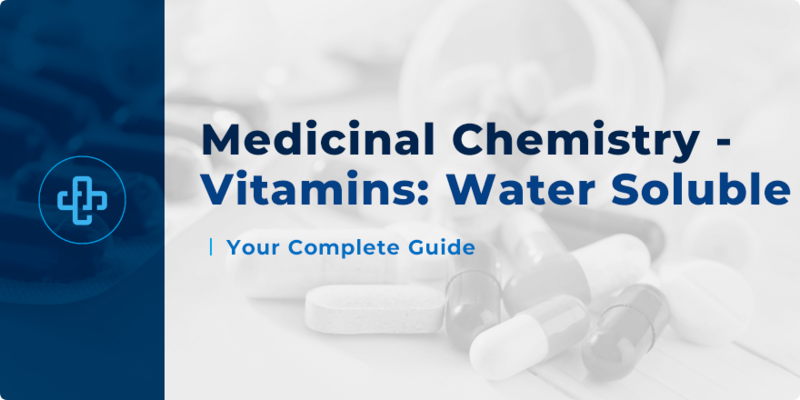 This section takes a detailed look at the medicinal chemistry of vitamins; specifically analysing the water-soluble vitamins and how they are used in a therapeutic context. The structures are also shown below. Note the presence of polar functional groups. These compounds play important roles in metabolic processes. The term vitamin B complex generally refers to supplements containing all eight. Understanding the intrinsic chemical nature of these compounds assists your knowledge not only of medicinal chemistry, but also pharmacology, biochemistry, and clinical therapeutics. Thiamine (also known as thiamine) is a water-soluble organosulfur compound containing a thiazolium ring linked to an aminopyridine ring through a methylene bridge. The phosphate derivatives of this compound such as thiamine diphosphate (also known as thiamine pyrophosphate) are involved in important biological processes. Thiamine pyrophosphate (TPP) acts as a coenzyme for many enzyme-catalysed reactions. TPP is derived from thiamine. This conversion is catalysed by the enzyme thiamine diphosphokinase. This vitamin is abundant in fish, eggs, beef, and certain animal organs such as the liver. The thermal degradation of thiamine results in degradation products with meat-like aroma. Potatoes and whole grain bread are also rich sources of the vitamin. The vitamin is also present in the pericarp and germ of cereals. Rice polishing is known to reduce the amount of Vitamin B1 significantly. Beriberi is a disease known to result from the deficiency of this vitamin. Beriberi is historically classified into dry beriberi, wet beriberi, and infantile beriberi. Dry beriberi is associated with the peripheral nervous system. Symptoms of dry beriberi include nystagmus, decreased muscle function, vomiting, and mental confusion. Wet beriberi is associated with the cardiovascular and other systems. Wet beriberi is characterised by dyspnea, pleural effusion, and/or increased heart rate. Thiamine, in the form of thiamine hydrochloride is available as oral capsules, and tablets under many names.Beriberi are usually treated by using thiamine alone. Continuing with our analysis of the medicinal chemistry of vitamins, we turn to Vitamin B2 – also known as Riboflavin. Riboflavin is a coloured water-soluble organic compound. 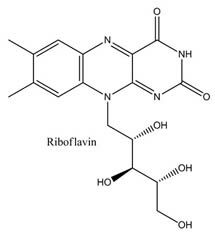 Riboflavin was once called Vitamin G. The vitamin acts as a precursor for the synthesis of cofactors flavin adenine dinucleotide (FAD) and flavin mononucleotide (FMN). This vitamin plays an important role in the metabolism of lipids, proteins, and carbohydrates. Riboflavin is generally thermally stable under food handling processes but is susceptible to photodegradation especially when exposed to visible light (420nm – 560nm). The ribitol-like moiety can be cleaved from the vitamin, resulting in lumiflavin. Phototherapy when treating neonatal jaundice may result in riboflavin photodegradation in the patient. Milk, eggs, leaf vegetables, legumes, and mushrooms are good sources of the vitamin. Intestinal bacteria are also known to synthesise riboflavin. The severe deficiency of riboflavin is known as ariboflavinosis. Signs and symptoms of ariboflavinosis include cheilosis and angular stomatitis, seborrheic dermatitis, glossitis, and decreased erythrocyte count. The condition is generally treatable by increasing intake of the vitamin. Riboflavin is also available in oral forms and in injectable form. Niacin is a colourless pyridine derivative with a C3 carboxyl group. Niacinamide, also known as nicotinamide, is the amide derivative of niacin. This compound also possesses vitamin B3 activity. Both niacin and niacinamide are precursors of important coenzymes, nicotinamide adenine dinucleotide (NAD), and nicotinamide adenine dinucleotide phosphate (NADP). Pellagra is the name given to the disease that most frequently results from Vitamin B3 deficiency. Signs and symptoms of pellagra include aggression, weakness, mental confusion, glossitis, ataxia, dilated cardiomyopathy, and diarrhoea. Pellagra can also lead to dementia and death. This disease can be treated using nicotinamide, which is available in oral and injectable forms. Food sources of niacin include tuna, venison, beef, chicken, avocados, tomatoes, whole grain products, and shiitake mushrooms. The body can also synthesise niacin from the essential amino acid, tryptophan. Pantothenic acid is an important precursor of coenzyme-A (CoA). Only the R enantiomer of the vitamin is biologically active. Meat is a major source of pantothenic acid. Other sources of the vitamin include avocados and broccoli. The only known therapeutic use of pantothenic acid is the treatment of deficiency. Signs and symptoms of pantothenic acid deficiency include sleep disturbances, headache, irritability, and fatigue. Because pantothenic acid is common in the diet, cases of deficiency are rare. Pyridoxine, along with pyridoxal and pyridoxamine and their phosphorylated forms are vitamin B6 vitamers. Pyridoxine will be the focus of this section. Pyridoxine contains a pyridine ring with methyl, hydroxyl, and hydroxymethyl substituents. In the body, this compound is typically converted to pyridoxal 5-phosphate (PLP). PLP acts as a coenzyme primarily for aminotransferase enzymes. Whole grains, cereals, corn, spinach, soybeans, bananas, avocados, cow’s milk, fish, and poultry are good sources of the vitamin. All three vitamers can be found either in free form or phosphorylated form. Animal sources are richer in pyridoxal whereas plant sources are richer in pyridoxine and pyridoxamine. Intertrigo and conjunctivitis are some of the symptoms of vitamin B6 deficiency. Somnolence, neuropathy, impaired memory, and confusion are some of the neurologic symptoms. Interestingly, hypervitaminosis B6 can also result in peripheral neuropathy. Sideroblastic anemia may result from deficiency of this vitamin. Vitamin B6 deficiency can be treated with pyridoxine. Biotin, also known as Vitamin H, is a water-soluble heterocycle that serves as a coenzyme for the carboxylase enzymes. These enzymes are involved in processes such as gluconeogenesis and fatty acid synthesis. Intestinal bacteria can also synthesise biotin from pimeloyl-CoA. Fish, eggs, chicken liver, meat, and leafy green vegetables are good sources of biotin. Like pantothenic acid deficiency, biotin deficiency is rare. As we saw with other medicinal chemistry of vitamins; excessive alcohol intake may result in deficiency. Genetic disorders can also lead to inborn or late-onset forms of biotin deficiency. Deficiency symptoms include the formation of scaly skin, alopecia, conjunctivitis, lethargy, and depression. Biotin supplementation is the main means of treating deficiency. Folic acid contains a pteridine heterocycle, para-aminobenzoic acid, and glutamate. This vitamin is also known as Vitamin M or vitamin Ф. In the body, folic acid is converted to biologically active derivatives. Folic acid and its derivatives are required for many biological functions. The vitamin is involved in processes such as DNA synthesis and DNA repair. It is important in situations of rapid cell division and cell growth such as in pregnancy. Folic acid’s tetrahydrofolate derivative serves as an enzyme cofactor for enzymes involved in the transfer of single carbon units. The vitamin can be found in a wide variety of foods. Good sources of the vitamin include seafood, some beers, meat, dairy products, yeast, liver, spinach, asparagus, and Brussels sprouts. Folic acid is generally stable. Thermal degradation of the compound while cooking meat results in small losses. Signs of vitamin B9 deficiency include weakness, loss of appetite, irritability, behavioural changes, weight loss, and heart palpitations. In adults, severe deficiency can lead to megaloblastic anemia. In children, deficiencies can result in slow growth rate. Pregnant individuals with Vitamin B9 have increased risk of giving birth to infants with neural tube defects. The primary treatment of B9 deficiency is through treatment with folic acid. This compound is available in tablet and injectible form. The tetrahydrofolic acid derivative, leucovorin is used in cases of accidental overdose of dihydrofolate reductase (DHFR) inhibitors such as methotrexate. DHFR inhibitors are used in cancer treatment. Leucorovin (folinic acid) is readily converted to other reduced folic acid derivatives and thus, possesses vitamin B9 activity. Vitamin B9 is particularly important when it comes to analysing its effects on pharmacology; things such as interactions, mechanism, and side-effects. 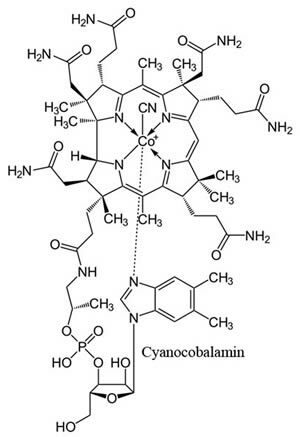 The vitamin B12 group refers to the cobalamins. These compounds possess a corrin ring with a central cobalt ion. The sixth coordination sire of these compounds is a variable. Vitamers of Vitamin B12 include cyanocobalamin and methylcobalamin. In the case of cyanocobalamin, the sixth coordination site is filled by a strong field, monoanionic and monodentate cyano ligand. Shellfish, fish, livers, poultry, and milk are sources of the vitamin. Plants and animals are incapable of independently biosynthesising vitamin B12. Bacteria and archaea have the enzymes needed for synthesis. Foods are often fortified with the vitamin. B12 is acquired from commercial bacterial production of the compound. Food products often fortified with B12 include breakfast cereals, and soy products. Vitamin B12 deficiency, which can be treated by using any of the common B12 vitamers, may result from inadequate dietary intake or impaired absorption. Symptoms include pale skin, heart palpitations, weakness, and bleeding problems. The term vitamin C refers to L-ascorbic acid and its salts, and other vitamers that possess vitamin C activity such as dehydroascorbic acid. Vitamin C serves as a cofactor for enzymatic actions which include collagen synthesis. The vitamin serves as a cofactor for certain dioxygenase enzyme, acting as an electron donor for the reactions. These enzymes are involved in biochemical hydroxylation reactions. Fruits and vegetables are the richest natural sources of the vitamin. Plant products that have relatively high amounts of the vitamin include chilli peppers, oranges, lemons, kale, garlic, broccoli, lychee, and melons. Scurvy is the disease resulting from a deficiency of vitamin C. Early symptoms include lethargy and malaise. Other symptoms include dry mouth, swollen gums, loosening of teeth, and formation of spots on skin. Loss of teeth, fever, neuropathy, and death may result as scurvy advances. In the past, scurvy affected and killed sailors, pirates, and soldiers who have limited access to food rich in the vitamin. Scurvy can be prevented or treated by using supplements or by increasing the consumption of food rich in ascorbic acid. The medicinal chemistry of vitamins, specifically the water-soluble variants, represent a diverse and interesting array of chemically distinct characteristics. These individual differences manifest themselves in ways that affect both our physiology as well their pharmacology; how they interact with other drugs. This completes our analysis of the medicinal chemistry of water-soluble vitamins; if you’d like to take a look at their fat-soluble counterparts, please see here for further information.